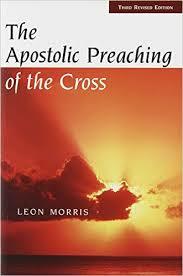 In his classic exposition The Apostolic Preaching of the Cross (1955; third edition 1965) Leon Morris dedicates a chapter to examining the phrase ‘the blood.’ In the chapter, Morris is responding to a particular view, viz. the idea that when Scripture speaks of an offering of blood, the term refers to the offering of life—life given and life released. He refutes this view showing that references to blood in relevant Old and New Testament texts speak not of life but death, and often a violent death. This contention holds true in contexts of sacrifice, and by extension, of Jesus’ death and Jesus’ blood: the ‘blood’ means his death. Morris begins by examining every reference to ‘blood’ in both testaments, and categorising them. The word dām is used 362 times in the Old Testament and these are grouped in the following categories: death with violence of some kind (203x), connecting life with blood (7x), eating meat with blood (17x), sacrificial blood (103x), and other uses (32x). From these figures it is clear that the commonest use of dām is to denote death by violence, and, in particular, that this use is found about twice as often as that to denote the blood of sacrifice. … As far as it goes, the statistical evidence indicates that the association most likely to be conjured up when the Hebrews heard the word ‘blood’ was that of violent death (pp. 113-114). We conclude, then, that the evidence afforded by the use of the term dām in the Old Testament indicates that it signifies life violently taken rather than the continued presence of life available for some new function, in short, death rather than life, and that this is supported by the references to atonement (121). The Greek term αἷμα is found ninety-eight times in the New Testament, of which about thirty-five refer to the blood of Christ. Like the word ‘cross,’ blood is used as a metonymy for the death of Christ ‘in its salvation meaning’ (126). This meaning includes the ideas of Christ’s blood as a ransom-price, a means of purging, or the element to ratify a solemn covenant (127). The blood of Jesus, therefore, refers to the death of Christ by which we are reconciled to God (Colossians 1:20), having been justified ‘by his blood’ and so saved from wrath through his death (Romans 5:9-10). We have been made close to God through his blood (Ephesians 2:13), for his blood has secured an eternal redemption for us (Hebrews 9:12; 1 Peter 1:18-19), and has purified our hearts, granting us confident entry into the very holiest of places, the divine presence itself (Hebrews 9:14; 10:19). If it is the case as Hebrews 9:22 states, that without the shedding of blood there is no remission of sins, was Jesus’ death necessary? Did God require the death of the Son in order to extend forgiveness? Why can God not simply forgive without suffering, violence, atonement and death? Does God require payment before he will forgive? That Jesus died is evident, as is the violence of his death. But is God responsible for this violence? Did God require this violence before he could forgive sins? Is God’s forgiveness predicated on violence in such a way that it legitimises violence as a necessary or at least inevitable feature of inter-personal relations and reconciliation? Did God purpose the violence of the cross or more simply foreknow that violence? Is God implicated in Jesus’ death as a God who is thus inherently and so also, eternally violent? The God of Abraham, the God of Isaac, and the God of Jacob, the God of our fathers, glorified his servant Jesus, whom you delivered over and denied in the presence of Pilate, when he had decided to release him. But you denied the Holy and Righteous One, and asked for a murderer to be granted to you, and you killed the Author of life … And now, brothers, I know that you acted in ignorance, as did also your rulers. But what God foretold by the mouth of all the prophets, that his Christ would suffer, he thus fulfilled (vv. 13-15, 17-18; cf. 4:10, 24-28; 5:28-30). Peter lays the blame for Jesus’ violent death at the feet of the Jewish leaders, and also insists that this activity was in accordance with the divine purpose revealed in Psalm 2. Although this is a classic example of the tension between divine providence and human responsibility, it may be best to understand Jesus’ violent death as the activity of the human participants in the drama, and see in Peter’s citation of Psalm 2, divine awareness of a broader pattern of human action coming to expression in this case specifically. As such, God has not acted violently as much as given himself into the hands of a violent humanity which consistently rejects the call and claim of God. In all these texts, however, (even those of Luther and the Lutherans) there is something unsatisfactory about the christological reference, factually important though it undoubtedly is. The reason for this is that notwithstanding all these earnest protestations the following question still remains unanswered: Is it the intention of these thinkers that serious theological attention should be paid to the assertion that the election is to be known in Jesus Christ? Does this assertion contain the first and last word on the matter, the word by which we must hold conclusively, and beyond which we must not conceive of any further word? Is it a fact that there is no other basis of election outside Jesus Christ? Must the doctrine as such be related to this basis and this basis only? Must it take account only of this basis? In this matter of election are we noetically to hold by Christ and Christ alone because ontically there is no election and no electing God outside him? Or is it rather the case that we are to understand this assertion merely as an impressively stated pastoral rule, a practical direction regarding the attitude which, rebus sic stantibus [as things stand], we ought to adopt towards this matter if we are not to be plunged into doubt or despair? Is it the case, in fact, that behind the pastoral (and in some measure the historico-psychological) truth that God’s election meets us and is revealed to us in Jesus Christ, there stands a higher truth which, for the sake of prudence and charity, must be withdrawn from the practical usage of the Church, a truth which cannot be denied or entirely suppressed, but which is so dangerous that it must be covered over and kept out of the reach of the curious like a kind of poison? Is it the case that, according to this higher and dangerous truth concealed for practical purposes in the background, while Christ is indeed the medium and instrument of the divine activity at the basis of the election, and to that extent He is the revelation of the election by which factually we must hold fast, yet the electing God Himself is not Christ but God the Father, or the triune God, in a decision which precedes the being and will and word of Christ, a hidden God, who as such made, as it were, the actual resolve and decree to save such and such men and to bring them to blessedness, and then later made, as it were, the formal or technical decree and resolve to call the elect and to bring them to that end by means of His Son, by means of His Word and Spirit? Is it the case, then, that in the divine election as such we have to do ultimately, not with a divine decision made in Jesus Christ, but with one which is independent of Jesus Christ and only executed by Him? Is it the case that that decision made in Jesus Christ by which we must hold fast is, in fact, only another and later and subordinate decision, while the first and true decision of election is to be sought—or if we follow the pastoral direction had better not be sought—in the mystery of the self-existent being of God, and of a decree made in the absolute freedom of this divine being? The trouble with attending conferences is that one can certainly become unbalanced; financially, that is. One’s savings account is unbalanced, or one’s credit card may be re-balanced, as the case may be. 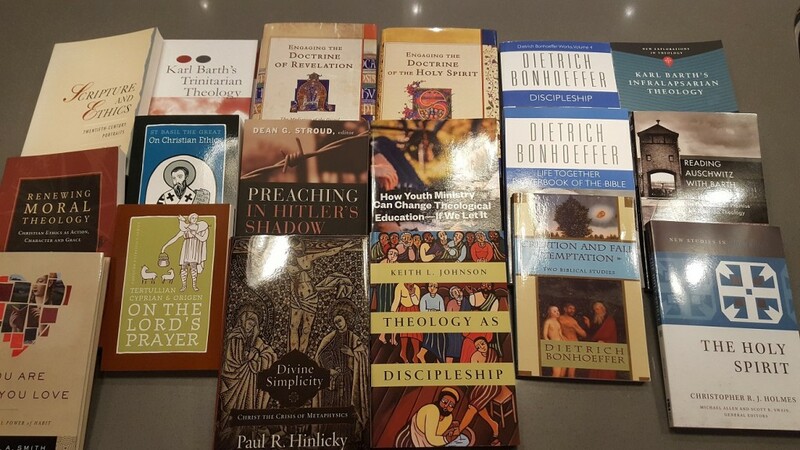 The photo is of new books picked up at the two conferences I attended in the last month… It is an eclectic collection (not unbalanced! ), reflecting some of the interests and work-related reading I hope to do in the coming year. Once more I find remarkable, the depth of theological reflection and pastoral wisdom Luther can pack into a short sermon. Multiple themes bristle in this short piece. 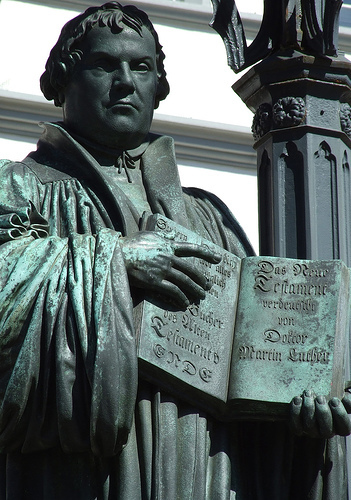 Luther appeals seamlessly to penal and Christus Victor metaphors of the atonement. We see the very prominent focus on the conscience and so also on the individual before God. Of course, justification and faith are present in his discussion, as is his prominent focus on the pro me, pro nobis—for me, for us: “Of what help is it to you that God is God, if he is not God to you?” (166). This is obviously a message for Christians rather than non-believers, though non-believers also might benefit from it. We learn that we are sinners having come to Christ. It is from the cross that we learn that we are sinners, and from the cross and resurrection that we learn we are forgiven and loved. And learning that we are thus loved and forgiven is the basis—the only basis—for Christian life and sanctification. Unless God inspires our heart, it is impossible for us of ourselves to meditate thoroughly on Christ’s passion. … You must first seek God’s grace and ask that it be accomplished by his grace and not by your own power. That is why the people we referred to above fail to view Christ’s passion aright. They do not seek God’s help for this, but look to their own ability to devise their own means of accomplishing this. They deal with the matter in a completely human but also unfruitful way (169). This is good and necessary pastoral wisdom from Luther, which also went unheeded by some in the Puritan and Pietist traditions—and still today. Those who seek to uncover their own sinfulness, to convince themselves of their own moral filthiness, and dredge over sins and errors time and again, have “to be sure, the appearance of wisdom in self-made religion and self-abasement and severe treatment of the body, but [such activities] are of no value against fleshly self-indulgence” (Colossians 2:23—my comment, not Luther’s). Luther obviously understands true meditation on Christ’s passion to be a theological activity, interpreting his sufferings through the lenses of such Scripture passages as “Christ died for our sins” (1 Corinthians 15:3). We look only to Christ and not to ourselves. In him we see both our sin and its remedy, and in him the pattern and the source of strength for truly Christian life. Although today we might shift some of the language and imagery, this is a fine example of preaching that is at once deeply theological and pastorally wise. In 1519 Martin Luther wrote a short “Meditation on the Passion of Christ” for Holy Week. His Good Friday sermon begins with three wrong ways by which to meditate on Christ’s passion. Some do it to vent their anger at the Jews or at Judas. Others do it superstitiously or blindly, carrying pictures, booklets, letters or even crosses on their person as a kind of talisman to ward off evil and misfortune. “Christ’s suffering is thus used to effect in them a lack of suffering contrary to his being and nature” (Luther, “A Meditation on Christ’s Passion” in Lull (ed. ), Martin Luther’s Basic Theological Writings, 165). Others feel pity for Christ, lamenting and bewailing his innocence. The correct way to meditate on the passion is to see his wounds as our sins, and so let our conscience be terrified and weighed down by the reality of human sin and divine wrath. They contemplate Christ’s passion aright who view it with a terror-stricken heart and a despairing conscience. This terror must be felt as you witness the stern wrath and the unchanging earnestness with which God looks upon sin and sinners, so much so that he was unwilling to release sinners even for his only and dearest Son without his payment of the severest penalty for them. … You must get this thought through your head and not doubt that you are the one who is torturing Christ thus, for your sins have surely wrought this (166-167). We must give ourselves wholly to this matter, for the main benefit of Christ’s passion is that man sees into his own true self and that he be terrified and crushed by this. Unless we seek that knowledge, we do not derive much benefit from Christ’s passion. The real and true work of Christ’s passion is to make man conformable to Christ, so that man’s conscience is tormented by his sins in like measure as Christ was pitiably tormented in body and soul by our sins. This does not call for many words but for profound reflection and a great awe of sins (108). After man has thus become aware of his sin and is terrified in his heart, he must watch that sin does not remain in his conscience, for this would lead to sheer despair. Just as [our knowledge of] sin flowed from Christ and was acknowledged by us, so we must pour this sin back on him and free our conscience of it. … You cast your sins from yourself and onto Christ when you firmly believe that his wounds and suffering are your sins, to be borne and paid for by him. [Luther cites Isaiah 53:6, 1 Peter 2:24, and 2 Corinthians 5:21] … You must stake everything on these and similar verses. The more your conscience torments you, the more tenaciously must you cling to them. If you do not do that, but presume to still your conscience with your contrition and penance, you will never obtain peace of mind, but will have to despair in the end (170). We see in the resurrection of Christ his triumph over the wounds and sins by which he suffered. We see also his love, and that of the Father, in his bearing of sins on our behalf. True meditation on the passion of Christ must progress from Good Friday to Easter Sunday. If we allow sin to remain in our conscience and try to deal with it there, or if we look at sin in our heart, it will be much too strong for us and will live on forever. But if we behold it resting on Christ and [see it] overcome by his resurrection, then boldly believe this, even it is dead and nullified. Sin cannot remain on Christ, since it is swallowed up by his resurrection. Now you see no wounds, no pain in him, and no sign of sin. Thus Paul declares that “Christ died for our sin and rose for our justification” (Romans 4:25). That is to say, in his suffering Christ makes our sin known and thus destroys it, but through his resurrection he justifies us and delivers us from all sin, if we believe this (170-171). Luther goes on to discuss the nature of a cruciform life, using the image of Christ’s suffering to resist temptation and the despair or sloth that may issue from adversity. Follow this link for a copy of the sermon and a historical introduction. The date, theme and a list of invited speakers for next year’s Karl Barth Conference has been announced. 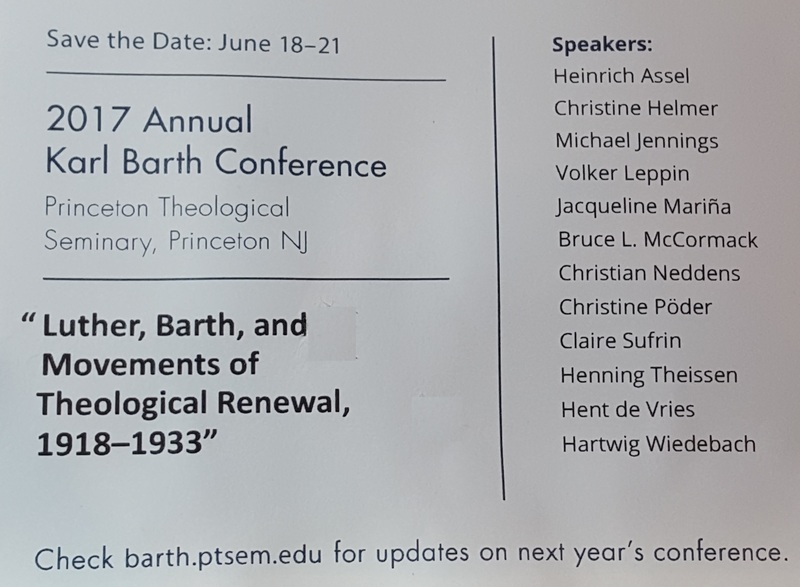 The Conference will acknowledge the 500th anniversary of Luther’s 95 Theses, with a wonderful theme linking Luther’s Reformation to a critical period in Barth’s own development and the movement which arose around his work. I would love to go there but may need to wait for the book. Keep an eye on the Barth Center website for further details in coming months. And the theme, date and invited speakers for next year’s ANZATS Conference in Adelaide has also been announced. 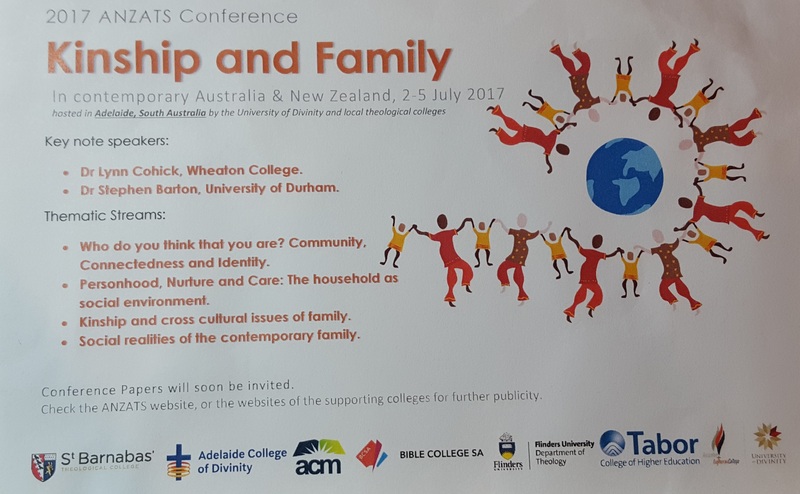 It looks to be a very different conference to this year’s Conference in Melbourne, but hopefully just as stimulating in its own way. Further information will be available in due course from the ANZATS website. This morning in worship we are singing Blessed Assurance which includes the phrase “washed in his blood.” George Hunsinger has remarked that modern dogmatic theology, where it still speaks of the saving death of Christ, usually does so without reference to the blood of Christ (Hunsinger, “Meditation on the Blood of Christ,” in Disruptive Grace, 361). Whenever the story which the church tells appears to dovetail neatly and without wrinkles with the stories which human beings like to tell about themselves and their destiny, it is likely that the church is cutting the cloth of its gospel to fit the pattern laid down by the Zeitgeist rather than the heilige Geist” (Hart, in Gunton (Ed), The Cambridge Companion to Christian Doctrine, 191). I do not think Hart’s critique can be fairly levelled at this person. In some respects the gospel this person is telling is not at all consonant with stories human beings like to tell about themselves. We like stories of heroism, of sacrifice, of power that triumphs, and yes, of victory won, even at the cost of violence. Violence is deeply embedded in human relationships and structures; it seems we are all capable of violence in one way or another, and so this person’s gospel wants to disrupt, challenge and overturn this pattern of human sinfulness. And yet; I am still concerned that the person is cutting the cloth of their gospel in a way which is not sufficiently attentive to the Holy Spirit’s witness in Scripture. The following verses show that the blood of Christ was a prominent theme in the biblical writers’ understanding of the saving work of Christ on the cross. Indeed, almost every New Testament writer shares this understanding, indicating its pervasive influence in the thought-world and faith of New Testament Christianity. Much more surely then, now that we have been justified by his blood, will we be saved through him from the wrath of God. And through him God was pleased to reconcile to himself all things, whether on earth or in heaven, by making peace through the blood of his cross. He entered once for all into the Holy Place, not with the blood of goats and calves, but with his own blood, thus obtaining eternal redemption. 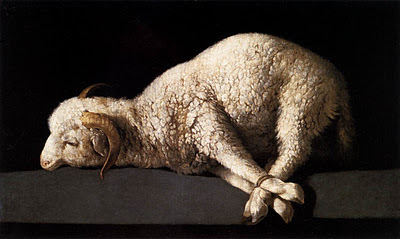 For if the blood of goats and bulls, with the sprinkling of the ashes of a heifer, sanctifies those who have been defiled so that their flesh is purified, how much more will the blood of Christ, who through the eternal Spirit offered himself without blemish to God, purify our conscience from dead works to worship the living God! And in the same way he sprinkled with the blood both the tent and all the vessels used in worship. Indeed, under the law almost everything is purified with blood, and without the shedding of blood there is no forgiveness of sins. Therefore Jesus also suffered outside the city gate in order to sanctify the people by his own blood. You know that you were ransomed from the futile ways inherited from your ancestors, not with perishable things like silver or gold, but with the precious blood of Christ, like that of a lamb without defect or blemish. And from Jesus Christ, the faithful witness, the firstborn of the dead, and the ruler of the kings of the earth. To him who loves us and freed us from our sins by his blood. In all these texts and others like them, we see that the blood of Christ functions as a sin-offering on behalf of humanity, and as the institution of a new covenant between God and humanity in Jesus Christ. The answer to my friend’s question must be, on the basis of the New Testament witness, an unqualified “Yes!” The blood of his cross is the basis of our forgiveness and reconciliation with God, and of the new covenant of which we have become heirs. More must be said, of course. Does Jesus’ bloody death implicate God in violence? I will endeavour to address this important question next week. The Karl Barth Study Group met for the second time at this year’s ANZATS Conference in Melbourne on July 4, 2016. This year six papers were presented at the Study Group meeting, an increase of three over last year’s meeting in Sydney. 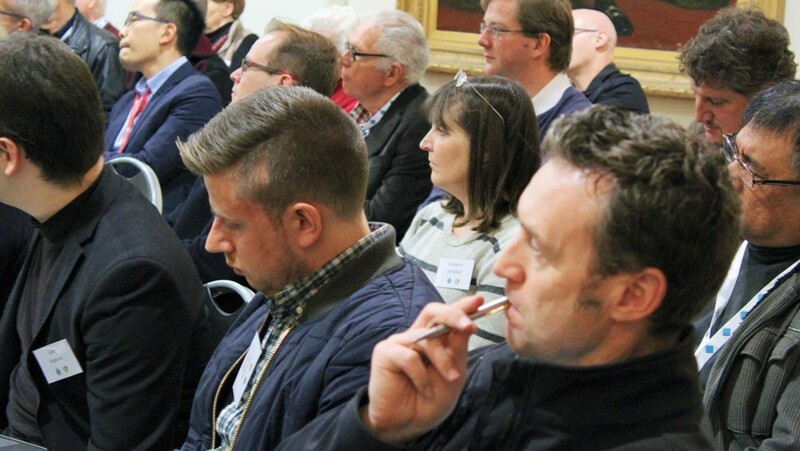 We also enjoyed more participants in the sessions this year, with lively discussion and Q&A after each session. It was exactly what I hoped for when I floated the idea a couple of years ago. Edmund explored the hermeneutical and trinitarian presuppositions which govern understanding of the atonement, before arguing that for Barth, the Deus pro nobis is the very Sache, the subject matter, of the doctrine of the atonement, which he unpacks in a fourfold substitutionary pattern. Geoff explored Barth’s reading and interpretation of Job in Church Dogmatics IV/3. Barth finds a certain correspondence between Jesus and Job such that Job functions as a witness of the True Witness who is Jesus Christ. 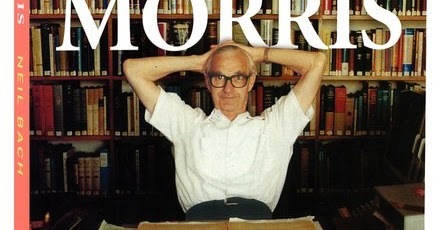 For Barth, Job is not about theodicy or a meditation on suffering. He is rather a witness who speaks the truth and unmasks falsehood. Christopher’s careful lecture detailed the work of the Holy Spirit in the immanent trinity and the outworking of this role in the event of the atonement. The Holy Spirit can never be untethered from Jesus Christ either at the cross or unto all eternity, the Spirit and the Son are one, even in their distinction. 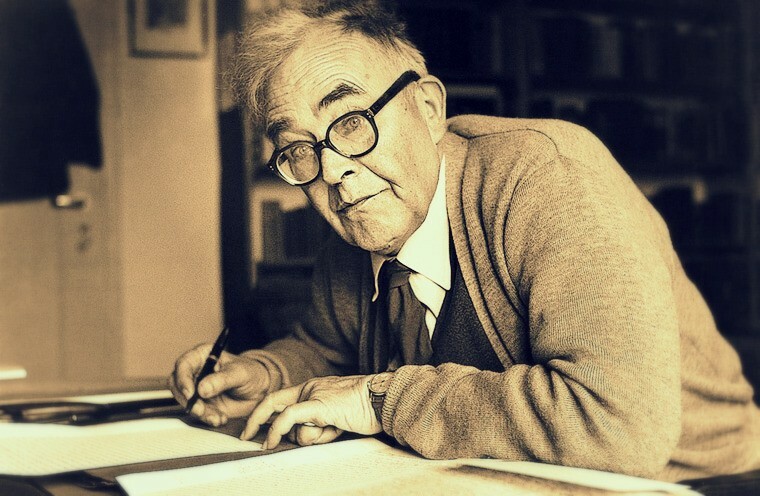 Chris responded to criticisms that Barth’s ethics are too abstract and indirect, arguing that Barth’s ‘indirectness’ is intentional, and intends to educate our moral imagination or tune our ears to hear and respond to the direct command of Jesus Christ. The use of a word in a student’s paper ‘peaked’ my interest today. Or did it ‘peek’ my interest? Or did it ‘pique’ my interest? The word used by the student did not seem correct so I went looking and found this happy little article at vocabulary.com. 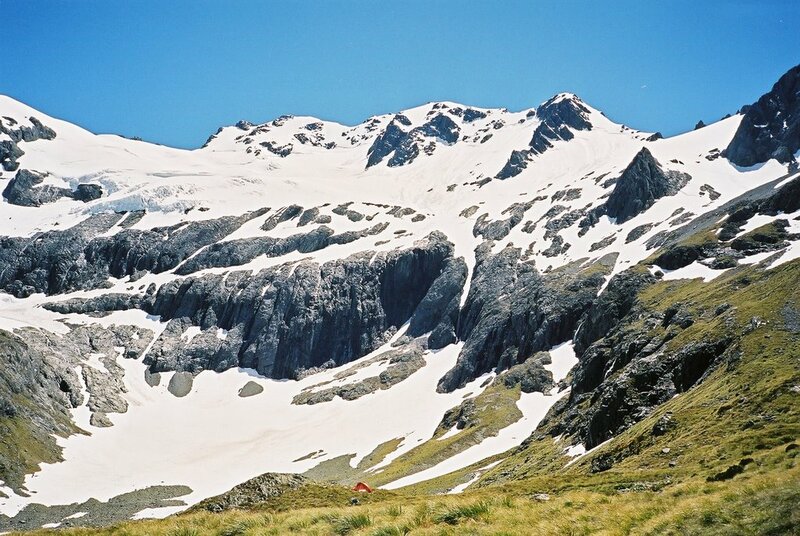 Hopefully this might pique your interest, but in the right kind of way! PS. Don’t let the picture lead you astray! I am not at all sure I can do justice to this psalm. When I first began reading it, I found it odd in several respects. There are two difficult issues with it. First, the opening verses are a cry to the Lord for help, a cry the psalmist justifies by appealing to his own innocence (vv. 1-5). I only wish that I could say with the psalmist, “You have tested me and you find nothing.” Perhaps the best way to understand this claim is to situate it in the very present context of accusation that the psalmist is facing: “With respect to these charges, you know, Lord, that I am innocent!” (Craigie, 162). Yet even the ancient Hebrews had difficulty with these verses, with the Midrash on Psalms constructing a dialogue from these verses in which God demonstrates to David that he cannot pass God’s test, and like everyone else requires God’s pardon and forgiveness (see Charry, 78). The second odd feature of the psalm, at least as it is presented in the NASB, occurs in vv. 13-14, where the psalmist prays that God would deliver him from the wicked—the very wicked whom it seems God has blessed and favoured! They and their children are filled with treasure and satisfied. He is in effect, asking God to reverse his policy with respect to the wicked. The psalm begins, as mentioned, as a cry that God would hear, give heed, and give ear to his prayer. He claims a just cause and so the prayer is a plea for justice from one who claims innocence (vv. 1-5). It is also a request for protection, including the beautiful words of verse 8: “keep me as the apple of the eye; hide me in the shadow of your wings” (vv. 6-9; cf. Deuteronomy 32:10-11). The ‘apple’ of the eye is the pupil, with the psalmist requesting that God protect him as he would the most delicate or vulnerable part of the body. Arise, O Lord, confront him, bring him low; Deliver my soul from the wicked with Your sword, From men with Your hand, O Lord, From men of the world, whose portion is in this life, And whose belly You fill with Your treasure; They are satisfied with children, And leave their abundance to their babes. Arise, O Lord! Confront him to his face. Make him bow! Deliver my soul from wickedness by your sword. Kill them by your hand, O Lord! Kill them from the world, their portion from among the living. But your treasured ones—you will fill their belly, sons will be sated, and they will bequeath their surplus to their children. Craigie acknowledges that his translation makes the prayer especially violent, but argues that the language should not be understood literally, but as part of the military metaphor rather than a precise expression of the psalmist’s desire (164). It sets the fate of the wicked and the faithful in stark contrast, in a way reminiscent of the two ways (see Psalm 1), and perhaps also funds a kind of prosperity message. The life of the children of God transcends the bounds of this life. Its primary concern is not its own fullness in this world, but the hope of seeing God and being transformed into his likeness. This religious and moral emphasis in life may not result in earthly prosperity, but the psalmist, however, suggests he will be satisfied. To see the face of God, and to be conformed to his image, is more than enough.